Drive isn’t anything like the trailer, as I am sure most of you know by now. The fact that the trailer markets the film as a “Fast and the Furious” type adventure has pissed off a lot of people, even causing one Michigan woman to file a lawsuit against the film’s distributor. All of this is pretty ridiculous, but if you go into Drive with an open mind, it’s easy to see why it has received so much critical acclaim. 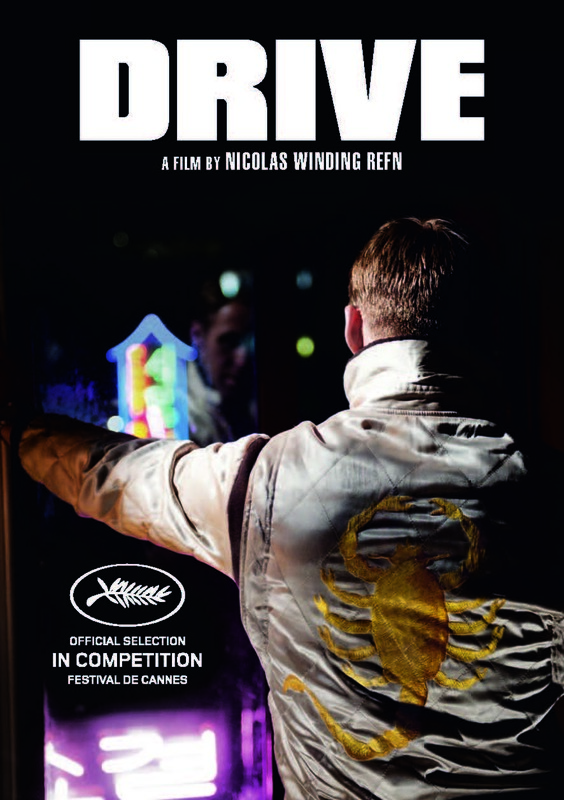 As more of an arthouse film than an action saga, Drive follows the man only known as Driver (Ryan Gosling), a stuntman who moonlights as a getaway driver. Long story short, the dude loves to drive. He builds a soft-spoken friendship with his neighbor next door, Irene (Carey Mulligan), but just as they are starting to hit it off, her husband, Standard (Oscar Isaac), comes back home after getting out of jail. Things begin to spiral out of control after this, as Driver takes on a major job that changes the worlds of everyone around him. 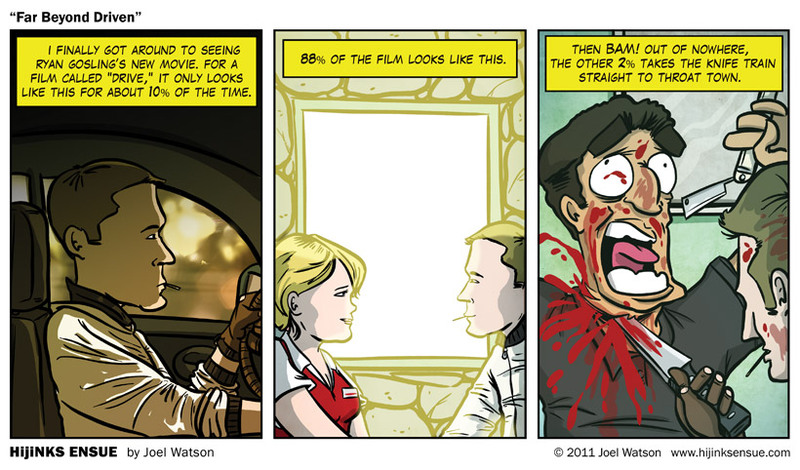 As the above comic states, a significant portion of the movie revolves around dialogue. Sparse dialogue at that. There are moments of terrific action, including a couple of adrenaline-spiking driving scenes, but the film moves along at a much slower pace than the trailer may lead viewers to believe. I loved the pacing of the movie, especially as the dialogue was sharp and well-written despite being very minimalistic. It was refreshing to see an “action” movie that is not made up of endless explosions and cheesy one-liners. The aforementioned bursts of violence are extreme and happen completely unexpectedly. The audience I was with gasped in horror as characters were taken down in some of the most brutal ways possible. Director Nicolas Winding Refn sure knows how to use violence to make a statement, especially given the fact that it was only used in short spurts. Much can be said about Drive’s style as well. The opening credits use a retro pink font that harkens flashbacks to the 1980s, and the music is obviously inspired by past influences. College’s “Real Hero” is used effectively in what is a defining moment in the film. Drive wouldn’t be as memorable without its stellar cast. Ryan Gosling, Hollywood’s darling of the moment, is simply excellent here. He is absolutely convincing as Driver, a man who seems to have a boyish charm at times but can also produce a nasty mean streak. Carey Mulligan, as his neighbor, is someone who I thought was miscast at first, but I quickly became a fan of her chemistry with Gosling. She is one of my favorite young actresses going today, and this role helped solidify this status. Other notable performers include the always fantastic Bryan Cranston as Driver’s employer, Albert Brooks as a vicious mobster (a nice diversion from some of his past roles), and Ron Perlman as a badass Jewish mobster. There’s even a blink-and-you-miss-it performance from Mad Men’s Christina Hendricks — always a treat to see her on the big screen. As long as you don’t go into Drive expecting a generic action flick, there’s a lot to like about it. In fact, there wasn’t much I didn’t like. The patient pacing, the brilliant cast, the slick style, the great soundtrack. This may be the best movie I have seen this year, and it’s going to be hard to top it in the next couple months. If you haven’t already, go see this in the theater. I saw this without expectations as I never watch trailers. It’s a movie with a very distinct style and something I liked a lot. Also was a big fan of the sound design, especially that scene with the shotgun, everybody just jumped when that happened. I didn’t like it as much as you did (7/10), but it is a movie that is worth checking out. Oh yeah, good call on the shotgun scene. That surprised the hell out of me. Glad to hear you enjoyed it as well. As you know, this is my film of the year. The only film I have given a 5 star rating to. I am so itching for this to be released on Blu Ray so I can see it again. Haha that’s great, man. It’s probably my favorite movie so far this year, and that soundtrack really is something else. That 2% part is why I’m not seeing this on the big screen. I might rent it and just ffwd that part. I’m not enamored w/ Gosling as much as everyone seems to be, not sure I ever will. I’ll just rent it. There are lots of other ones I’d rather see on the big screen. Sweet review Eric, Hands down the slickest film of the year for me. A slick 80’s styles western and man one helluva great score/soundtrack. Only thing I liked equal to (not better) this year was 13 Assassins and X-Men First Class…and great grab on that comic. Love it! BTW, do you like Refn’s other films, specifically Valhalla Rising…like Drive I just LOVED it and in a way it’s kind of the same movie and sheer intense filmatic poetry that is divisive as they come. Hey, thanks Marc! Glad you enjoyed the comic, I know I got a kick out of it. The only other Refn film I have seen is the first Pusher, which I really enjoyed. I’ll be sure to check out Valhalla Rising. Thanks for the rec! I liked it too. In fact I called it a ‘must-see’ in my review of it last September. Your review was succinct and well thought out. I enjoyed reading it. Thanks for the kind words! 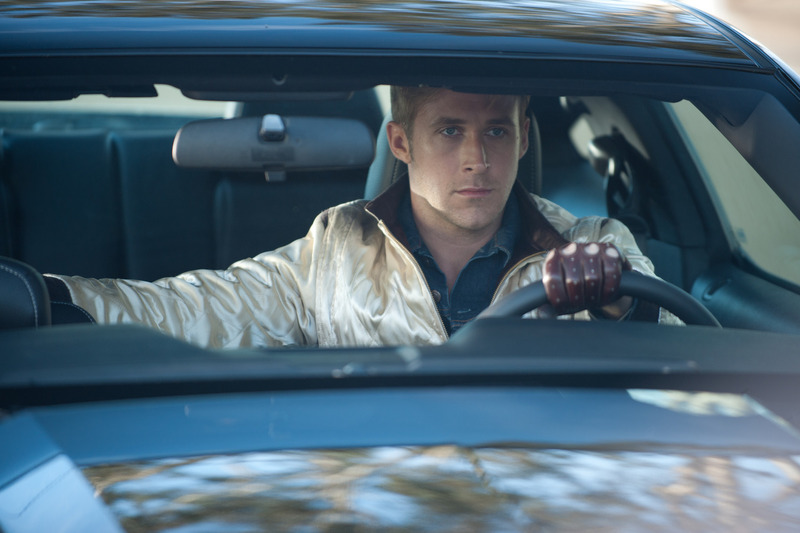 Looking back, I still think Drive was the best movie from last year. I can’t wait to revisit it. This movie sounds good, so convenient I have it at home then 🙂 waiting for the weekend to watch it! Good deal — hope you enjoy it! Glad to hear you liked Drive! I’m still annoyed that it didn’t receive any significant Oscar nods. The Ides of March is another good one, especially if you are into politics at all.